While Bravo’s “Real Housewives of Beverly Hills”’ star Kyle Richards has had her fair share of stressful moments on the popular TV series, she has nothing but good things to say about her experience with SculpSure, a non-invasive laser fat-reduction treatment. 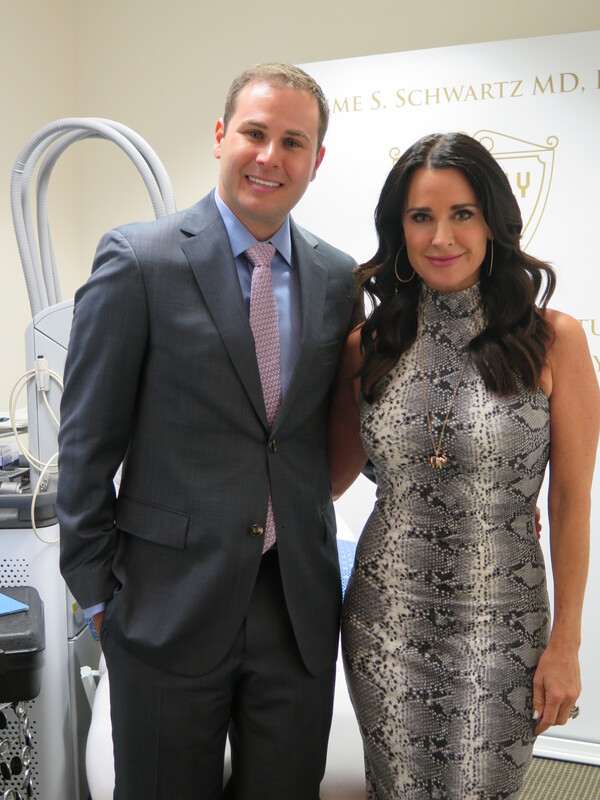 The reality star recently described the procedure to journalists during a press event at Dr. Paul Nassif‘s (Bravo’s “Botched“) renowned clinic, Spalding Plastic Surgery: “SculpSure was so easy, I was so happy that it was completely painless! I am such a wimp with pain and I really didn’t feel a thing!” Richards enthused. The new light-based body contouring treatment uses laser-based technology to selectively target and destroy fat cells without affecting the skin’s surface, requiring no surgery or downtime. With results that can be seen in as quickly as six weeks, it’s no wonder that non-surgical fat-reduction procedures are increasing in popularity. SculpSure uses lasers to target fat cells. SculpSure is FDA-approved for the love handles and belly, and is being promoted as an innovative alternative to surgery for men and women who don’t have much weight to lose. Over time, the damaged fat cells are naturally absorbed and removed from the body. This revolutionary laser treatment was the first to gain FDA approval for non-invasive lipolysis (melting and removal of unwanted fat deposits) for the flanks and abdomen. In June 2017, it was also approved to treat the back and thighs. SculpSure is a good option for patients seeking to eliminate stubborn pockets of fat. As with any cosmetic treatment, SculpSure costs vary depending on the doctor, his or her geographical location and other factors. That being said, SculpSure is a relatively expensive treatment. Prices generally ranges from $1,200 to $1,500 per body area. Because it is considered a non-medical procedure, SculpSure usually is not covered by health insurance. SculpSure vs Coolsculpting — which is better? While both of these non-invasive treatments are viable ways to get rid of stubborn deposits of fat, Sculpsure reviews seem to suggest that it may be a more precise and reliable method of eliminating unwanted fat. Sculpsure is quicker and more easily tolerated, and unlike some Coolsculpting patients, Sculpsure patients have not reported side effects such as nerve damage and delayed onset of pain. Aftereffects vary from patient to patient, but potential SculpSure side effects include redness, bruising, pain at the injection site, swelling and bleeding. Small bumps may appear under the skin when pushing on the treatment area(s). Larger, sometimes inflamed bumps have been reported as well. If you do experience any worrisome side effects, make sure to contact your doctor immediately.